Bookmark OS is meant to mimic your desktop and it works in similar ways. Don't hesitate to try an action that you would normally do on your computer such as drag and drop or selecting multiple items at once. If you have any other questions, send us an email at dave@bookmarkos.com or use the feedback form by clicking 'Give feedback' in the nav in the top right if your logged in. A popup with fields will appear. 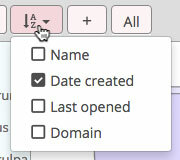 Update the appropriate fields and click 'Update bookmark' or 'Update folder' to save. After you click 'Delete', a confirmation popup will appear asking, 'Are you sure you want to delete?' 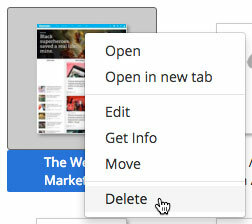 Click the red 'Delete' button in the bottom right of the popup to complete the deletion. Double-click the bookmark or folder to open it, just like opening a file or folder on your computer. The other way is to right-click a bookmark or folder and click 'Move.' A folder select menu will appear. Navigate to the destination and click 'Select.' Then click 'Confirm' to complete the move. You can show/hide, re-order, and change the width of list view columns. 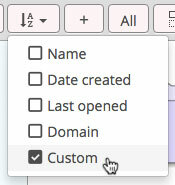 To enter the list view customizer, click the gears icon. You can then click and drag the columns themselves to re-order. Click and drag the icons on the right to change width. Click the X in the top-right to exit. Hold down the 'command' key while clicking items to add more to the current selected items. If you click an item that is already highlighted while holding 'command', it will de-select it. To select a continuous range of items at once, click the first item to highlight it, then navigate to the last item you want highlighted and hold shift while you click it. This will select all items from the first to the last. There are a number of ways to see what folder a bookmark is in. 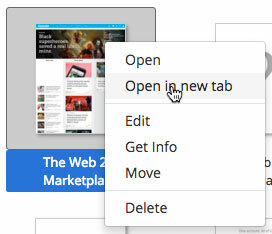 If you are in 'View all' or 'Search' you can right-click a bookmark and select, 'Open containing folder.' Once inside the containing folder (or any folder) you can also see the parent folders by clicking the folder icon at the top. This will give a list of the parent folders (picture 1 below). You can click on any of the folders to open them. You can also view any items parent folders by right-clicking and selecting 'Get info.' You will see the folder path in the 'Where' column (picture 2 below). You can click on these folders to open them as well. Click and drag select multiple items. Once multiple items are selected, right-click one of the selected items. A context menu will appear. Click 'Delete' and a confirmation popup will appear. Click 'Confirm' in the popup. Custom sorting allows you to customize the order of items by dragging them into the order you want. For example, you could keep your 'Read later' folder as the first folder on your desktop. To enable custom sorting, select 'Custom' from the sort dropdown and then click on the 'Move item' icon ( the one with two squares that appears to the right of the 'All' button). When custom sorting is enabled, you will be able to drag items into the positions you like. When you are done sorting, click the 'Move item' icon again to disable custom sorting. Search results can be sorted just like any folder. Use the arrow navigation in the top left to navigate to and from search results. Click the small 'x' in the search input to go back in navigation. Items can be moved from search results into different folders. 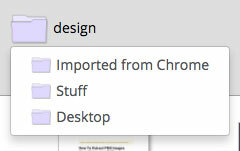 'View all' mode shows all your bookmarks in one view, allowing you to sort them. This is useful if you want to find that last bookmark you created but can't remember where or maybe you recently opened a bookmark but can't find it. You can toggle 'View all' mode and sort by 'Date created' or 'Last opened.' You can toggle 'View all' mode by clicking the button that is furthest right in the nav called, 'All.' To leave 'View all' mode, use the navigation arrows in the top left or click the 'All' button again to toggle it off and go back. Click the triangle icons to the left of the folder icons to show the folders inside a target folder. Folders in the 'Folder tree' can be opened with a double click on the folder icons. The 'Folder tree' can be resized by clicking on it's right border and dragging. Tags can be accessed by clicking the tag icon in the top left corner of the nav on the left. 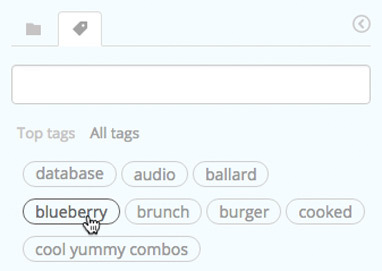 Tags act as filters and an active tag will filter any view that you are in. For example, you could enable a 'to read' tag, perform a search and it would only search bookmarks tagged with 'to read.' To view all bookmarks with a tag, you would click 'view all' and then activate the tag. Multiple tag filters can be activated at once and tags can be searched with auto-complete. Time filters can be accessed by clicking the clock icon in the top left corner of the nav on the left (to the right of the tag icon). Time filters behave similar to tags but instead will only show bookmarks that are created within a certain time period. For example, enable the, 'Last 24 hours' filter to only view bookmarks created within the last day. This is a useful way to remind yourself what you bookmarked recently or to ignore older bookmarks. You can add or remove tags from multiple bookmarks at the same time by highlighting the bookmarks, right-clicking, and selecting 'edit.' When you add or remove a tag, it will get applied to all the highlighted bookmarks. You can edit and delete tags by right-clicking the tag itself. When you right-click, a context menu will appear. When you delete a tag, it will get removed from every bookmark. Keyboard shortcuts allow you to quickly navigate Bookmark OS. You can do things like use the arrow keys to navigate items, open items, go forward/backward, and more! Click here to learn more. Images and GIFs use live previews to give you a useful preview. You can create individual notes which use a simple yet powerful text editor. This allows you to leverage the organization power of Bookmark OS for your notes and web clippings. To create a web clipping just highlight the part of a website you want to clip, copy it, and paste into a note.